Pitching in a tight pennant race with just four days left in the regular season, Addie Joss came up big with the most efficient perfect game in history. Joss needed just 74 pitches to record a 1-0 win that moved his team into a tie for first, two games ahead of that day's opponents— the Chicago White Sox. That particular day, Joss bested Hall of Famer Ed Walsh, who struck out 15 batters and yielded but one unearned run. 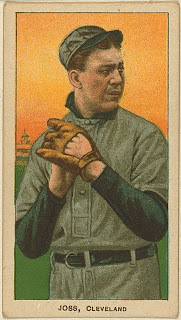 Cleveland's tall right-hander only managed three strikeouts, but won the game by setting every hitter down in order. Joss' playing career was cut tragically short by illness in 1910 and a year later he passed away at just 31 years of age. He was inducted into the Baseball Hall of Fame by vote of the Veteran's Committee in 1964 in recognition of his 160-97 record with a sparkling 1.89 career ERA.